I love salads. During summer it’s really the prime time to dig in and really stuff ones face with fresh seasonal veggies and herbs. This is a salad which can inspire you to use whats in season, from salad varieties to different herbs and just throw it together to create a big hearty and beautiful salad. If you want to dress it up, check out the vegan recipe index to find something you fancy to add on the side or toss the salad in. Cut the broccoli into smaller pieces and steam until tender yet still crisp. Takes 3-5 minutes. Let the broccoli cool off. Wash and dry the rest of the ingredients and prepare as per instruction in the ingredients list above. 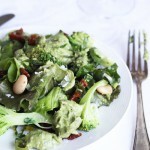 Layer the mixed green salad as a base, then add mangold, Dino kale and onions. 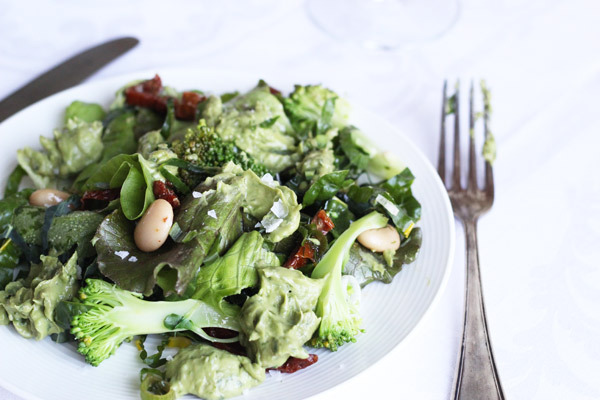 Add beans, sun-dried tomatoes and place the broccoli on top. Decorate with thinly sliced horseradish and buckwheat leaves. If you don’t have horseradish leaves, just replace it with other fresh herbs that complement the flavours in the salad, such as oregano, thyme or basil.